Who knew that 3D Imaging would be a tech tool for a sculptor? With the assistance of Adonis Bronze located in Alpine, Utah, Sculptor Gary Lee Price saw a way to utilize 3D Digital Laser scanning as part of the artistic process. 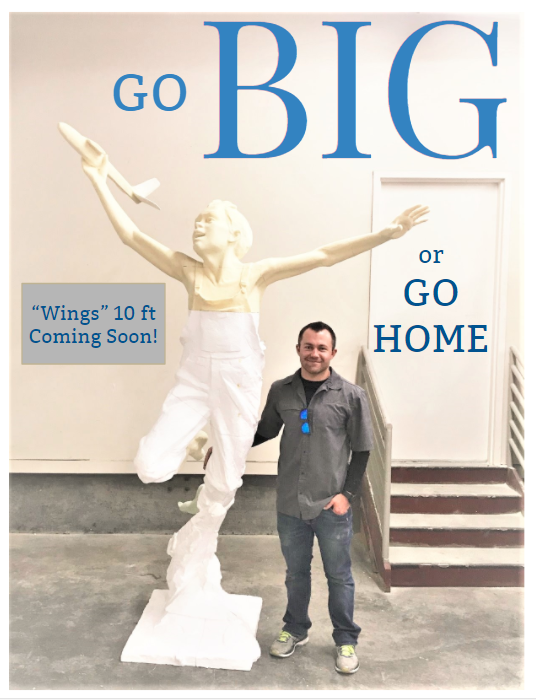 Gary brought his original 50” “Wings” sculpture to Adonis Bronze to be 3D laser scanned as a way to significantly enlarge his work of art. Once every nook and cranny of the sculpture was scanned, the details were programmed into the CNC milling machine along with the enlargement percentage specifications. In order to create an enlarged replica of the original sculpture, the machine cut out huge sections of foam that were then pieced together like a puzzle. Gary then took this 10 ft. foam form back to his studio where he applied clay over it. Now a new mother mold can be made and the lost wax process can begin at Alchemy Arts. It is a real time saver for Gary because now he doesn’t have to sculpt from scratch to create an massively enlarged version of his original work.